The Army Headquarters Building in Knez Milos St. No. 33 was designed and built between the two world wars, when Belgrade became the political and administrative center of the new state, the Kingdom of Serbs, Croats and Slovenes. From the beginning until today the edifice has had the same purpose: it was the accommodation for the Ministry of Defense and the military services. For that reason the “War room” was closed to public, and the citizens of Belgrade have rarely had the opportunity to see the interior of this pearl of architecture with a magnificent hall. An imposing edifice, rich in architectural and decorative plastics, the General staff was built between 1924 and 1928, designed by the Russian architect Vasily Baumgarten. The building has remained one of the most prominent examples of public buildings erected in Belgrade in the academic style. At the beginning, Department of the Army and Navy was placed there, and today it houses the Military Security Agency and Military Intelligence Agency. The interior was very richly and carefully crafted. 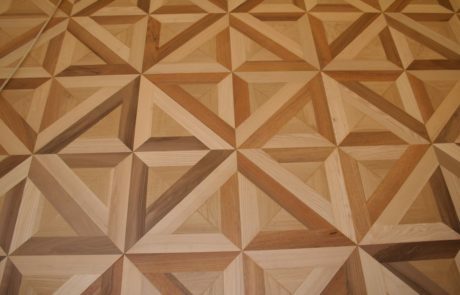 A variety of materials and decorative elements were used in the processing of floors, walls and ceilings, taken mostly from ancient and Renaissance era. Technically speaking, the architects evaluated, the building is impeccably performed. Entrance and ceremonial “War room” are resolved in a wealthiest manner. Above the entrance to the hall, on the rough hewn stone a relief is set, “Samson and Lion” by Vladimir Zagorodnjuka. The Hall has laterally placed windows, coated with light and dark marble. 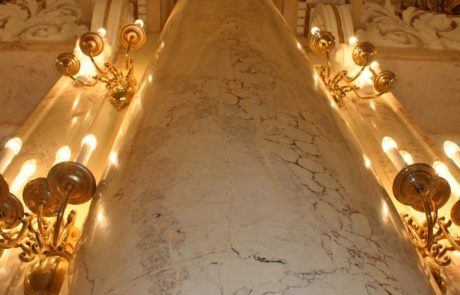 Among them, are series of rhythmically set marble columns, with Ionian capitals. 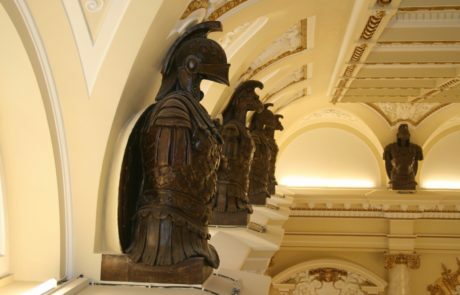 Above the pillars are busts of warriors in armor who “kept” the hall and from which it got its name. Sculptures were made in cast, but the skills of coloring and shading all the details, have contributed to the serious atmosphere and have strengthened quite a different impression: bronze soldiers lined up along the sides of the hall. 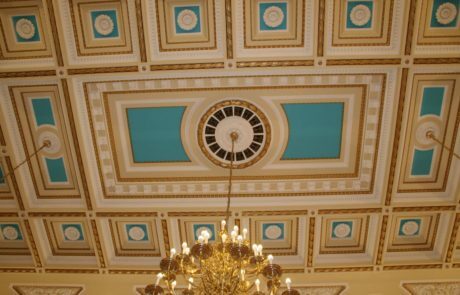 The ceiling is decorated with medallions and floral motifs, and above the semi-circular windows and the gallery, the oval ornaments which represent a two-headed eagle and the Serbian coat of arms are interspersed. 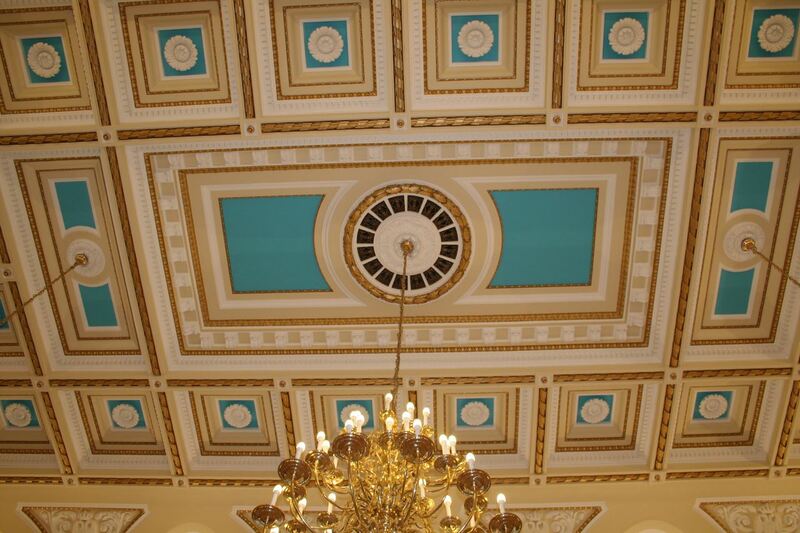 Since the building of the General Staff shared the fate of the earth, every historical period on the edifice. 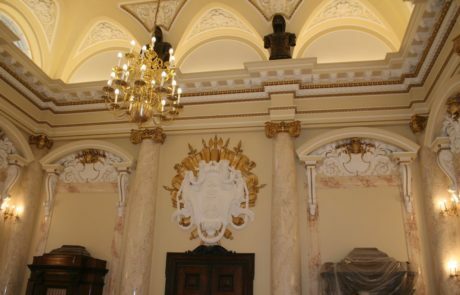 The emblems of Kingdom of Serbs, Croats and Slovenes in an opulent medallion above the entrance can be seen in the “Hall of warriors”, along with the military symbols of the two-headed eagle in an ornament, placed above the sculptures of warriors. There are also emblems with the four firesteels (four S symbols) and the lion from the period of the Republic of Serbia and Montenegro. 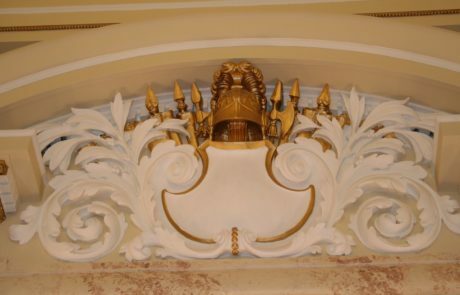 During the restoration of the hall, there were sculpted and placed the state emblems of Serbia. Serbian coat of arms is above the door, in the center ornament with military symbols that are carried by two female figures.